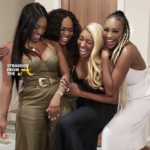 The Real Housewives of Atlanta’s 11th season is on and pippin’ and the ladies have gotten along great thus far (for the most part). This week’s episode is appropriately titled ‘A New Addition’ as new peach holder Shamari Devoe is finally introduced to the group. 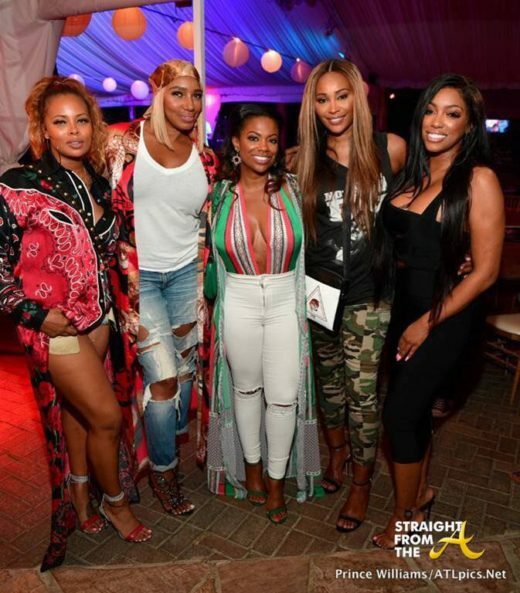 Back in Atlanta after their Miami getaway, Eva and Porsha hit the gym to work up some sweat and shade, while Kandi reconnects with old friend Shamari DeVoe from the music group Blaque. Meanwhile, NeNe and Gregg travel to Houston and receive surprising news about Gregg’s recovery. 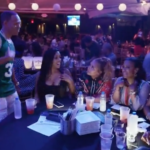 The ladies attend ATL Live to check out Shamari’s performance with Blaque, but Shamari’s husband Ronnie’s advice to Kandi about her own group Xscape falls on deaf ears. 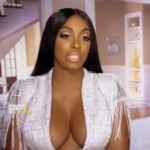 As Porsha continues to float on cloud nine about her relationship, Kandi finds out potentially damaging information about Porsha’s man that may pop her love bubble. 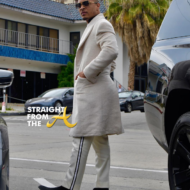 Eva Marcille has been throwing slick shade to her fellow model for weeks now and I predict it will soon come to a head. 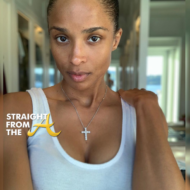 In this week’s episode, Eva and Porsha get to know each other better during a workout training session and the ANTM alum does not hold her tongue when speaking of her fellow peach holders. 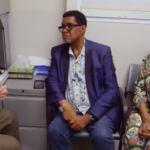 It was previously revealed that Gregg has been recovering after having surgery to remove a cancerous portion of his colon and now we follow him for a follow up appointment. 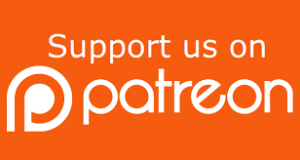 While it seems doctor’s removed the cancer, it is suggested that Gregg consider chemotherapy to kill any remaining cancerous cells in his body. 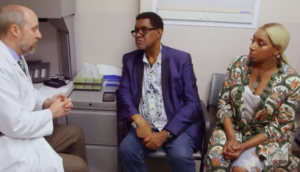 The doctor also informs the couple that without chemo, it’s possible that the cancer could return. Chemo isn’t the only option however, there are alternative measures i.e. holistic therapy that aren’t as invasive. While the doctor doesn’t have any specific remedies, he advises Gregg to consider all of his options. Later, Gregg & Nene receive a visit from Cynthia Bailey. During the visit, Gregg reveals that he’s been researching healthier alternatives to chemo and that he’s received several suggestions online… i.e. eating a snake! Kandi Burruss has been acting like she could care less about any of the girls this season, which is probably why she’s recruiting for her ‘kandi koated clique’. Kandi is opening a new OLG Gang restaurant and I guess it’s the perfect time to get her ‘gang’ together for a petty party. For some reason, Kandi digs up Jamie, Porsha Williams’ old assistant, because (she claims) Jaimie does good work. But we don’t witness Jaimie working. In fact, we see a gossip session between Kandi, Jaimie & Carmon… who doesn’t even work for Kandi anymore! 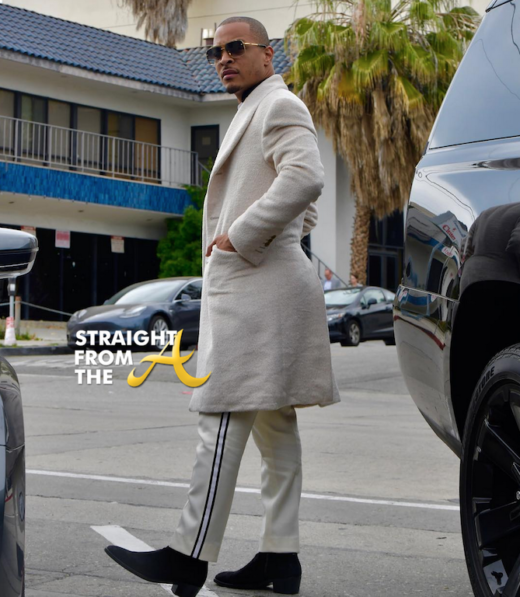 The ladies all share details about Porsha’s new man/baby daddy/fiancè i.e. he buys all of his women Rolexes, has tattoos of several women on him etc. All of that could be true… but why is it Kandi who’s attempting to pull the receipts? Didn’t she just say last week that she’s staying out of it?? 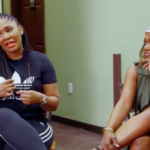 It’s Porsha’s boyfriend’s theme… at least according to Kandi’s friend Carmon and producers did a great job of breaking it down as two separate conversations were going down (Kandi and her crew vs. Porsha and her mom). Kandi is the ringleader when it comes to getting other people to do her dirty work. She’s done it for years but she’s on some next level messiness this season. 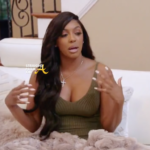 As she dishes dirt between Carmon & Jaime she gets all the tea on Porsha’s new boo! Jaime reveals Dennis pretends he cooks for chicks. Apparently Dennis has a slew of women who are at his beck and call (at least according to Jaime). Dennis buys the food and then has the women cook a week’s worth of food for him. On a related note, Porsha is gushing about her new love with her mom, Diane and she reveals that Dennis loves to cook for her. Jaime spills that “her friend” dated Dennis and that he’s even gotten the friends tatted on him. Kandi co-signs that she has “friends” too and that he did the same with her. Meanwhile, Porsha tells her mom that Dennis plans on getting her face tatted on his back. And I would be remiss if I didn’t mention how Kandi’s bringing Porsha’s ex-friend into the fold is a little bit reminiscent of Phaedra helping Kandi’s former employee (Johnnie) with his lawsuit. 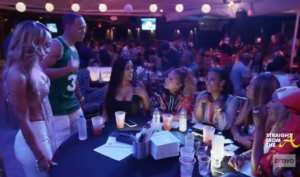 Shamari Devoe is finally introduced to the group and it already seems that her husband, Ronnie Devoe of New Edition has stolen her peach! Shamari already praises him for providing her with such a great life. They have twins, a nanny and are aspiring to be the next Beyonce & Jay-Z with a new duet album called ‘Mari & Me’. 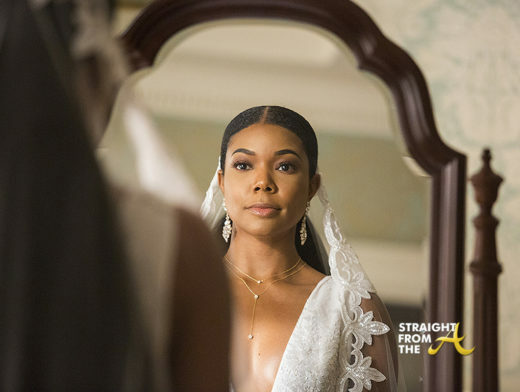 As proof, we get to see the couple’s interactions in the studio and even follow Shamar to ATL Live on The Park, where she meets all of the women. 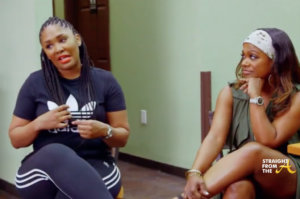 When the ladies all meet Shamari and Ronnie, the New Edition singer immediately throws shade at Kandi, offering her advice on Xscape performances. 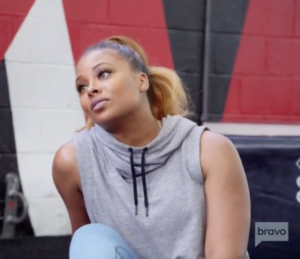 Kandi takes offense but even Nene states that she should listen. 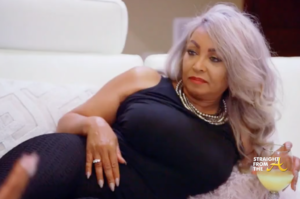 Meanwhile, Cynthia announces that she’s planning a ‘Bailey-Q” at her house to introduce everyone to her new boo. 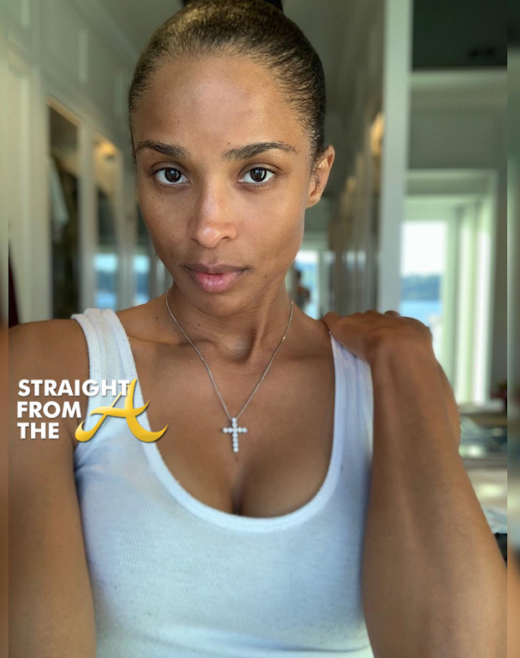 Everyone is invited… including Shamea Morton, who Eva feels some kinda way about for bringing up those lezz-bun rumors in Barcelona. Eva’s feeling spark an interesting statement about Shamea being “Black” as opposed to “Blaque” (with a Q). 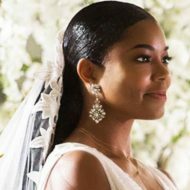 The comments sparked a huge colorism debate last night as many felt Eva was attempting to diss Shamea for having dark skin. This season just got more interesting. What were your thoughts about this week’s episode of The Real Housewives of Atlanta?